*** Sorry Rob, I beat you to it. 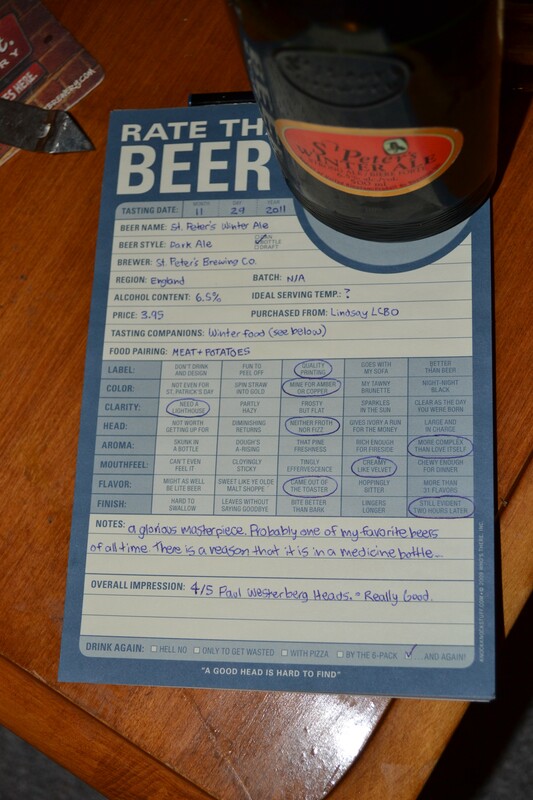 I was actually really surprised to find out from Nagy senior that no one had done a review of this beer yet. As far as I know, every member of the beer collective has tried this incredible brew. I suppose all of you were just so mesmerized and captivated by it’s holy demeanor that you just had to take a seat and appreciate this rather than take the time to review it. I can completely understand that, for I got a little bit lazy over the last week and rather than reviewing the rest of the Mill St. Sampler pack like I said I would, I just drank them all instead. I do like to occasionally relax and just simply enjoy my beers too! Although I don’t want to sound like reviewing them is a grieveous, painful process. It’s not. I shouldn’t be complaining. 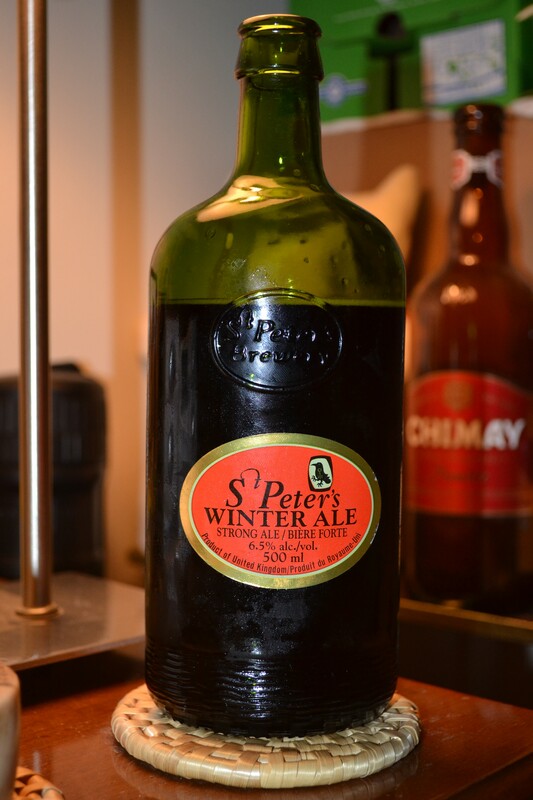 – St. Peter’s Winter Ale comes to us from Suffolk England, where it is brewed at a restored medieval hall. – The spring water used as the base of the beer has been continually supplied by an underground spring for around 700 years. – The unique flask shaped bottle has been used by the brewery since 1770. St. Peter’s Winter Ale is a really good breer. It is definitely deserving of the name Winter Ale, it is creamy, smooth and filling but not syrupy. The color is a deep copper/ ruby. 6.5% alcohol content contributes to a warming, satisfying mouthful. The head is thick to begin with (this one you ought to dump into your glass) and fades to a nice, thin veil. The aroma is slightly roasted, blunt and dry. To me this tastes like a spicy campfire with some damp peatiness. It’s just so damn good, you have to try it to know. This is not a good beer to start off the night with, because except for a few select Trappist brews, there are few beers that could top the complexity of a St. Peter’s. Usually English beers are lighter in alcohol percentage and are much thicker, heartier, and could easily replace lunch. St. Peter’s has it’s own very unique style that separates it from all the other English beers that I have tried such as Caffrey’s, Tetley’s or Smithwicks. This ale is in a completely different world, although geographically very close to where those beers originated. Wow. An absolute favorite. I look forward to Winter Ale’s appearing with all the other rarities on the shelves around Christmas time. This is one to buy lots of when you can, because they won’t last long at all. So stock up because they are available now! Age one and see how it tastes next Christmas. Click to read my paper review! The first time that I tried this beer was actually months ago, when I spend three months living an alternative (and in my view, idealistic) lifestyle trying my hand out at organic farming on the west coast of British Columbia. There, the Powell River liquor store had this beer in stock at all times. I had only ever tried a sip of someone else’s, but I finally decided that I would give this beer a whole-hearted taste and review it myself. This a pretty good one. Organic too, so it gets points for effort and conscience contribution. Has a nice rolling, soft texture and smooth flavor. Not very spicy, but complete and satisfying. As the name implies, it has a nice ruby red color. 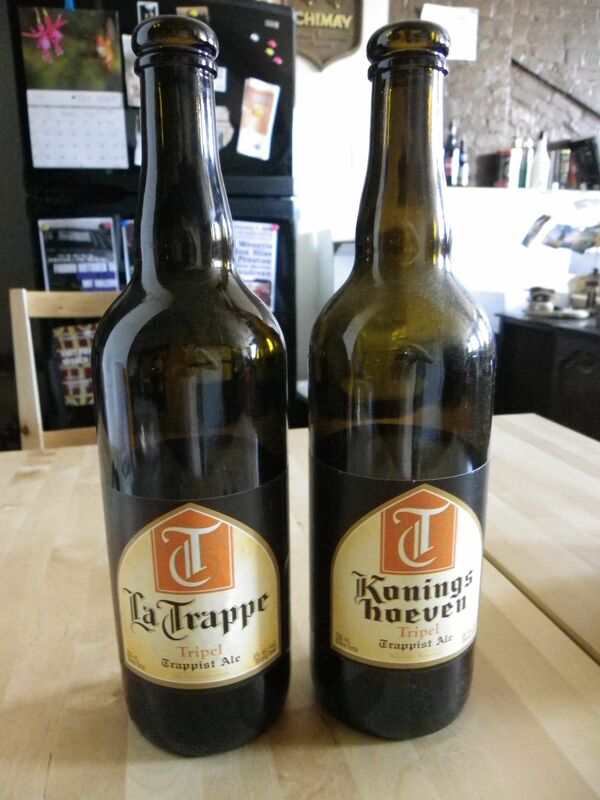 I would certainly recommend trying it, I would get this again if there were non of the trappist family of beers available or other great English masterpieces like St. Peter’s or Samuel Smith. Decent, and also organic, which is admirable. This time I’m using the Coopers English Bitter kit and added some hops and amber malt extract into the mix. It’s been fermenting away for a few days now and I just took the first final gravity reading. It’s @ 1.010 from 1.050 (original gravity). 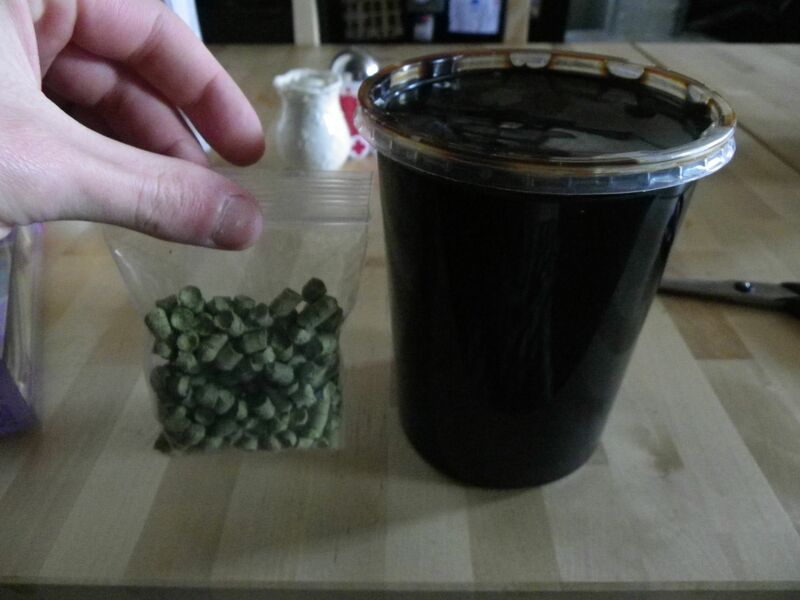 After applying the simple ABV formula of (OG – FG) / 7.46 + .5… this brew is going to be 5.9%! Now that’s more like it. I’m taking another FG reading tomorrow to make sure it’s done fermenting, and then it’s time to bottle. I’m really looking forward to this one. I do believe that this brew will destroy my previous attempt. Expect a review in a few weeks. 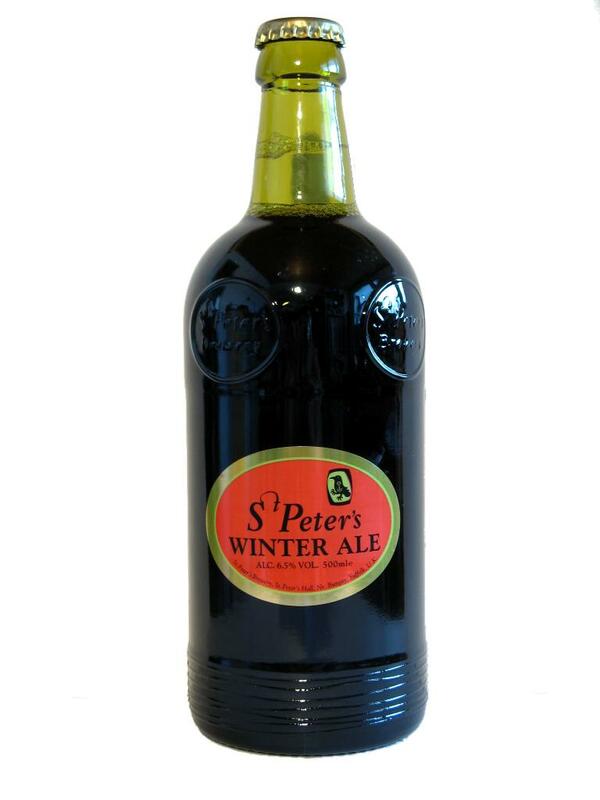 Thank-you, St. Peter, for brewing this heavenly beverage. If one day, I walk with you, St. Peter, we shall savour one together. For now I will continue to purchase them for $4.67 per 500ml from my friendly neighbourhood BC liquor store. The people at this store are intense man, they ask for 2 pieces of I.D. EVERY time. Apparently at ‘ALC 4.5%’, a minor might get too krunk, so they’ve gotta cover their asses. This beer is so tasty, that when all the bubbles that were left in the bottle after pouring it had popped (BIG, soapy looking bubbles), and turned into a tiny bit of liquid in the bottom, I made sure to pour the rest into my jar; I’m not wasting one drop. Yes, I used a jar again, and yes, I own a St. Peter’s glass. I miss my glasses. The St. Peter’s glass is actually my favourite beer mug entirely. It is very tall, handsome, manly, and wide enough to thoroughly enjoy the flavour with both aromatic senses. 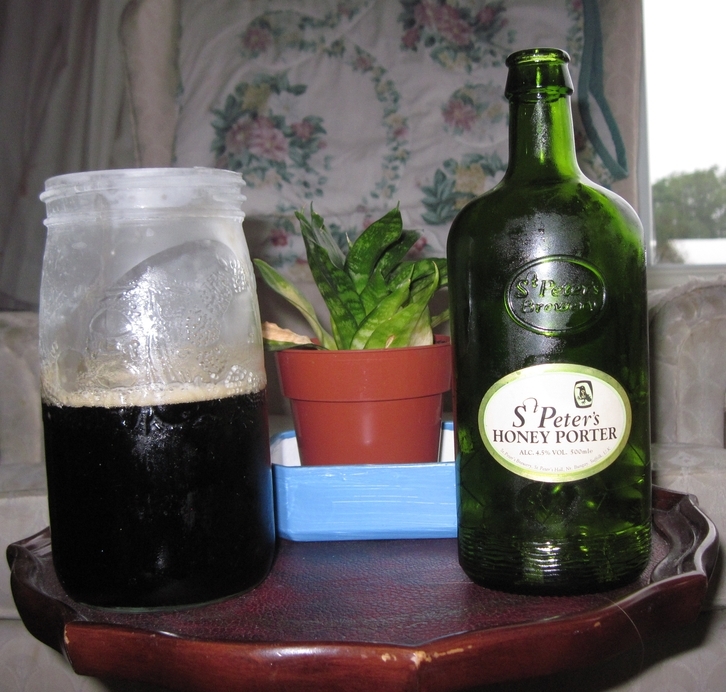 I would have enjoyed this honey porter even more with my St. Peter’s mug. It’s a serious mug for serious beers. There is no handle because their beers are great, even after being warmed up by your big, sweaty, ape hands. I did chill this beer in the fridge before consuming and it was as good cold as it was to the last luke-warm drop. If you ever happen to bump into me at St. Peter’s Hall in Nr. Bungay, Suffolk in the U.K., beware: I am likely very drunk. I might have to try them all if I ever make it there. It could even be an entire weekend’s endeavour. Or a month’s. Do not deem me an ‘easy marker’ as I rate this beer. This being only my second review and I’m giving it the same high mark as the first, does not imply that I love all beer equally. It means I have been inspired to review these two primo beverages because they are so good that I am compelled to share them with the world. Don’t buy them at the liquor store in Powell River though, cause I want them all. I’ve also seen them in the Christmas gift packs in Ontario, and probably at Chester’s in Hamilton. Drink up when you get the chance. Though on the back of the bottle, drinkaware.co.uk warns you to “know your limits”. It recommends that men only consume 3-4 units daily, and women should stick to 2-3 units. A 500 ml bottle of Honey Porter is considered 2.25 “UK units”. The name given to this beer could not have been chosen with a more humble disposition towards the quality of this beverage. The warm color, aroma and flavour are without comparison, lending to a smooth, lingering sweet-bitter taste. Easily makes you forget that outside the weather is likely completely cold and dreadful. The St. Peter’s Winter Ale is one of three other seasonal beers, including a summer ale, strong ale and wheat beer. These brews are only prepared during certain monthly intervals annually, so this gives folks initiative to enjoy the beer while you can get it, because soon you won’t find it until next year. This keeps into the rhythm of the physical seasons, but also of our natural acceptance, anticipation and expectation of great new things to come. Be it the first blooms of spring, the brilliant autumn leaves, or the next summer ale from St. Peter’s, good things come to those that wait. Once you get what you waited for, it only tastes sweeter. 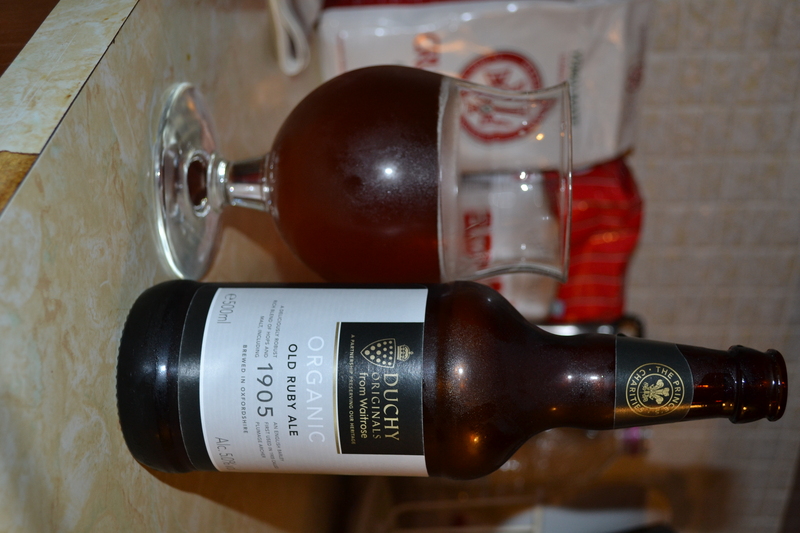 Another glorious quality of the ale is that it is quite strong for an ale, levelling out at a 6.5% alcohol content. This ale is distinct in this way, for the beer in itself is not overly heavy, but this high concentration greatly enhances the ale’s potential at being a rich, lustrous drink. In all, an incredible beer that is well worth the wait. If you are not patient, stock up while you can. If St. Peter’s doesn’t teach you about patience and endurance, it at least shows you how to be prepared for the troubled times ahead (the summer without winter ale). This beer gets 4 Paul Westerberg heads. Maybe not for breakfast, but ideal with your Christmas ham. Or your summer salad. Just drink it.